“This is the tenth anniversary,” said Tammy Coogan, pausing, “that the Knights have ridden for Ashlyn,” as though she was talking about real friends, people from whom their goodness has become part of her life; part of her daughter's life. Mrs. Coogan and Ashlyn have been in active-treatment and rehab hospitals since June 1 of this year, when she went in for surgery to SickKids hospital in Toronto. “Pelvic Osteotomy, Femoral Varus Derotational Osteotomy, a right Dega Osteotomy, a right adductor longus (lengthening of Hamstrings) and Botox on right side. For the rest of us to understand, even somewhat, as far as the surgery goes, this means that her right femur was cut in order to half rotate her knee, sharing bone from her hip as a bone graft to her leg. All this was followed by a hip replacement. They moved to the Holland Bloorview rehabilitation children's hospital on June 13 and are slated to be discharged on September 14, a total of 14 weeks. The arrangement is that a parent must remain with the child for the whole time. This assures better recovery for the child and less stress on the staff, where funding will not be provided for continuous one on one attention to any one patient. 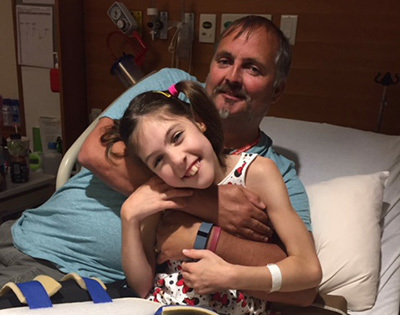 Ashlyn and her mother are booked into a semi-private room, meaning they share with one other patient and parent, the parents sleeping on reclining chairs (“so, I'm a bit sore now,” she admits.) and sharing shower and bathroom facilities. Just before June 1, Ashlyn developed pneumonia, a chronic problem for her. It ended in three days extra at SickKids, to put her on antibiotics. For the last few weekends, Mrs. Coogan has been going home to see her other daughter, Ashlyn's twin sister, Lacey, whom she naturally misses very much and who misses her mother, losing the whole summer to spend time together. However, her extremely resourceful parents, Tammy and Tom Coogan, researched all they could and brought in other therapies and tools to help her do better than her prognosis. Thus, she was able to crawl and to walk with a walker. Her cognition was also in advance of what was supposed likely due to the learning tools they discovered. They two are where they are and there are emotional advantages to that at the moment, other than the medical care. Said Mrs Coogan, “It's good for her to be with other kids so she's not the only one. [Over all this time], she has two new best friends. It's good for the parents as well. We share what others are doing day by day; you realize you're not the only one. Every year, the Knights of Columbus in Orangeville hold their Knights' Annual Motorcycle Charity Poker Ride and Silent Auction. The rides have been, in addition to a good day out, riding through this lovely countryside, a fund-raising day to support one or more local families with disabled or afflicted children. Their focus has been to help a situation of difficulty with a family living in this area, to make their donation specifically rather than to an institution. Over the time, they have helped other families but, for the last several years, they have centred their attention on the twin girls of the Coogan family. Ashlyn is going to attend the Ride on Sunday, September 9. Although Tom Coogan has been working for Zehrs as store manager in different towns, most recently in Orangeville, in October, 2017, Loblaws instituted a downsizing policy and abruptly laid off several of their store managers, including Tom Coogan. So, Mr Coogan has been at home with Lacey for the time of Ashlyn's surgery and rehabilitation. All along, the Knights have understood that Ashlyn's requirements, with special treatments, especially Botox, not covered by OHIP, plus the equipment essential to her condition, like a wheelchair, walkers, braces, private speech therapy and more, all entail large costs that are beyond the family income. Both Mr. and Ms. Coogan have told us that the monetary assistance the Knights have given them has made a real difference to how well their brave little daughter, Ashlyn, is doing. The Knights' 2018 Motorcycle Charity Poker Ride and Silent Auction will take place on Sunday, September 9, from Orangeville Curling Club, 76 Fifth Avenue, Orangeville. Registration is from 8:30 to 10:00 a.m.